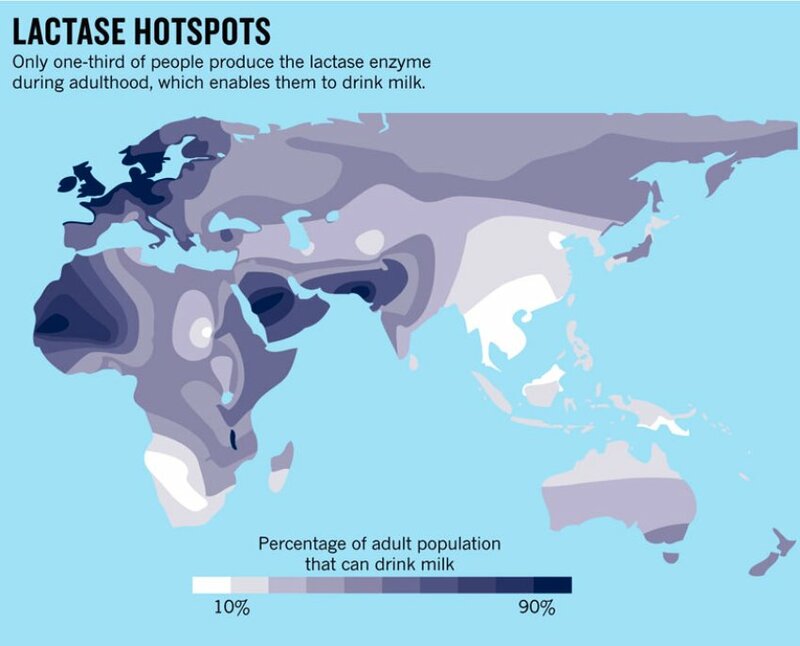 Lactase, the enzyme that allows individuals to digest lactose – a sugar found in dairy products – is, for the most part, on the evolutionary decline. Only one-third of people produce the lactase enzyme during adulthood, which enables them to drink milk. Lactose intolerance is a condition in which the body has difficulty handling lactose. It is caused by a deficiency of the enzyme lactase, which is produced by the cells lining the small intestine. Lactase breaks down lactose into two simpler forms of sugar called glucose and galactose, which are then absorbed into the bloodstream. People with this condition may get diarrhoea, stomach pains and bloating if they drink milk or eat dairy products. Some people are born with a tendency to develop lactose intolerance; others get it as a result of gastroenteritis or chemotherapy. The treatment is mainly to avoid lactose.